St. Martin is Anguilla's closest neighbor and knowing the ferry system is key to enjoying its great food, jet airport and chic shopping. The Anguilla ferry terminal is in the village of Blowing Point. You turn south toward St Martin off the main South Hill road at the traffic light by Connors Rental Car. The terminal is at the end of the road--park your car anywhere you can find a place. Enter the Departure Lounge and pay your $2US departure tax. This is not your fare, just the tax. Sign the manifest clipboard (don't forget to take your passport with you--this is a trip to another country) and wait until the immigration officer picks it up and starts checking people off at the door. If you need help, there are usually baggage porters on both sides -- tip about $1 per bag. Getting from the Airport to Anguilla? A visitor gets from Princess Juliana airport in St. Maarten and to Anguilla via the ferry: Laine's Arrival. A hotel describes transfer options: La Sirena Tips. The ferries vary, but are small, none take vehicles, all protect you from the weather. The crossing is about 20 to 30 minutes each way and ferries run every half hour during the daylight. They collect the US$10 fare on board ($12 after 5pm). 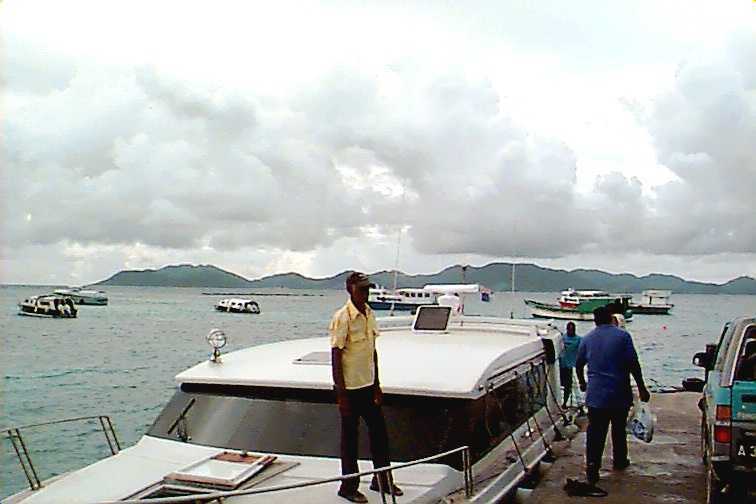 The ferry deposits you on the waterfront in Marigot, the French side (see picture). You show your passport (usually no forms to complete) and you are in France! To return you pay the French a $2 tax and $10 or $12 for the ferry. There is a landing card to fill out for Anguilla. Don't miss the last ferry at 7PM. 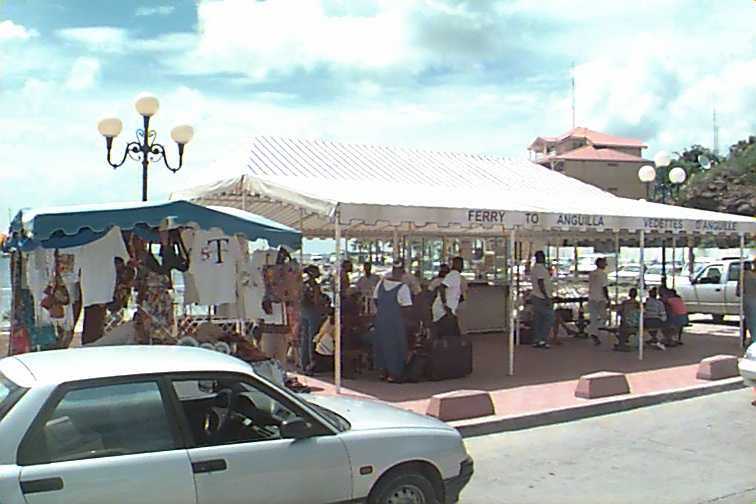 As you step off the ferry, the tourist office is just to your left, the public market is in front of you. Marigot is one of the best things about St Martin, so you could easily limit your visit to this town. Narrow streets, cute old buildings, restaurant-lined harbour, good shopping, great pastries and wonderful, inexpensive French food. Marigot is like visiting France, but many people speak English. Go early at 8AM or 9AM, shop and walk, have a pastry and coffee at a bakery, browse some more, select a nice place for lunch (many stores close for lunch anyway), and return home to Anguilla after lunch. Remember, St. Martin feels more humid and hot, has more crime, so be careful, and is closed on Sunday and Saturday after lunch. Sail the "Bluebeard" to Anguilla's offshore cay, Prickly Pear. Phone 011-5995-52898 for reservations. Sail the "Tahuna II" from Marigot to Sandy Island on Sunday. Also sails from to Anguilla on Tuesdays and Thursdays. Helicopter ride to Scilly Cay. There is a Marigot street map on the web. On it, you arrive from Anguilla at location C-3. As the map shows, Marigot is only about 4 blocks deep. Starting at Rue de Republique you walk at most 6 blocks to the Port La Royale, the harbour. If you want to catch a mini-bus to Phillipsburg, you walk up Rue de Republique to Rue de Holande and wave down a minibus that says Phillipsburg. One of the attractions of St. Martin is the golf course, which is in good condition now, but by March in the dry season it could be parched. It is easy to get on, since the Mullet Bay Resort is still closed. The only busy times are Saturday and Sunday mornings. You don't need to call for a tee time. If your clubs are heavy, tip the porter to carry them on the ferry and take a taxi on the other side ($10 to $12 to the golf course is the official fare.) Or you can catch a mini-bus to either Phillipsburg or Mullet Bay. On a Phillipsburg minibus, if it is empty, ask the driver if he isn't really going to Mullet Bay. If not, get out at the KFC and the Shell Station (fare is $1 this far) and catch a Mullet Bay mini bus. If he takes you all the way, the fare is $1.50 per person. Or you could take the Link ferry to the airport and catch a minibus from there, but it costs $5 more on the ferry. Green fees for visitors are $105 plus 3% turnover tax. There are no special restricted days. If you live here, you can become a member of the St. Maarten Golf Assocition and play at reduced rates. Then you can leave your clubs at the course for $25/month. Link Ferries has added the new Link Cat to their original Link ferry. Read all about it in this news story. And the link.ai web site has been vastly expanded with music and a huge picture gallery about taking the boat between Anguilla and St. Martin.